i. The revision of service charges to POPs on subscriber registration to POPs will be effective from 01st November 2017.
ii.The POPs will continue to have the option to negotiate the charges with the subscribers, but within the prescribed charge structure. iii. 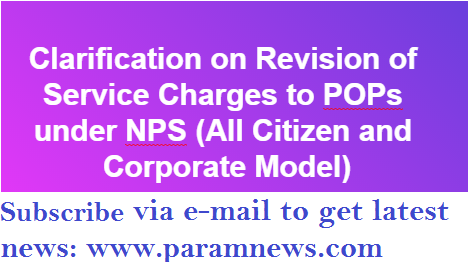 The newly introduced persistency charge of Rs 50/- per financial year will be applicable on accounts under NPS- All Citizen Model associated with the POPs for more than 6 months in a financial year and wherein the subscriber contributes minimum contribution of Rs. 1000/- in Tier I account during the financial year. This charge will be payable annually to the associated POPs by deduction of the units in the CRA system after closure of the financial year. iv. The service charges on subsequent transactions by the subscribers associated with the POPs through eNPS platform has been increased from the existing 0.05% of the contribution amount to 0.10% of the contribution amount subject to minimum of Rs.10/- and maximum of Rs.10000/-. The revision of this service charge will be effective from 15th November 2017. All concerned are advised to take note of the same. 1. With a view to incentivize the POPS to actively promote and distribute NPS, POPs are allowed to collect charges for the various services provided by them. 2. A new service charge related to persist ency payable annually is being introduced, as shown above and will be paid to POPs for each subscriber. whose account has been opened by them and who contributes a minimum of Rs. 1,000/- in a financial year.